Hello! 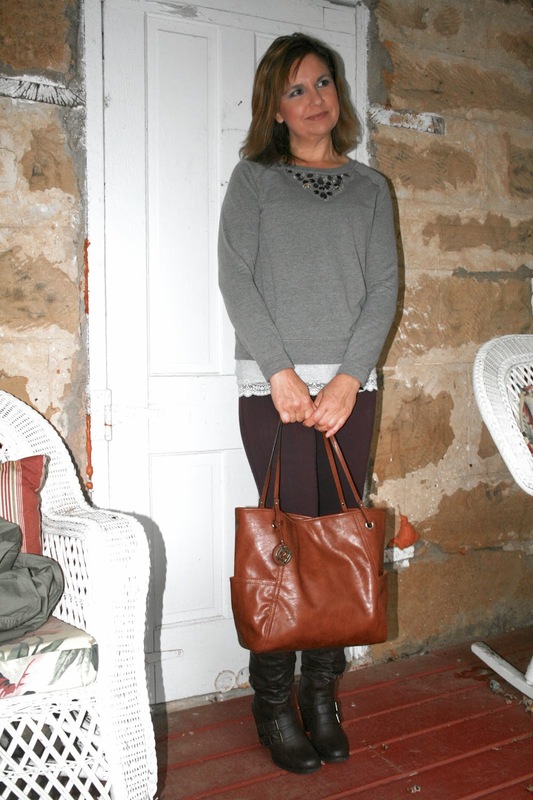 This week's Fashion Over Fifty post is all about the new Camouflage Trend. One would have to be blind or from Mars to not have noticed that the camouflage print is everywhere this season. Now, I've personally been struggling with jumping on the bandwagon with this trend for two reasons. Number one, I actually was in the U.S. Army for six and half miserable years of my life, and when my enlistment was over, the first thing that went in the garbage bin was anything green or camouflage. I never wanted to wear that color or style again! The second reason is that camouflage reminds me of hunting season, which I loathe. You see, I live in a prime hunting country, and every fall my neighborhood is filled with dead animal carcasses hanging from tree branches or out of the back of a pick up truck and with strange people dressed like Rambo everywhere. My peaceful, quiet, beautiful, natural surroundings, turn into a war zone where I hear gun shots all day long, which disturb my peace of mind. Sorry if I offend anyone by saying this, I'm not objecting to hunting if you love to hunt, I'm just saying I don't like hunting season for these reasons. It is just not my cup of tea. So naturally when I began seeing the Camouflage Print in fashion my first instinct was 'gag'. However, after weeks of seeing this trend everywhere (or by the sheer power of advertising), somehow, someway, I began to soften and actually (gag) started to like this trend and I almost (gag again) bought a camo shirt at the store the other day, but resisted the impulse. 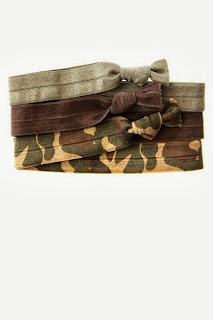 Now my fashion posts are all about fashion for women over fifty, so I started to wonder 'should older women wear camo?" My immediate answer would be 'no, it's too trendy and it is for the younger generation', but, then I reminded myself of one of my previous posts where I debated whether or not older women should wear denim jackets or maxi dresses and I concluded in that post that it was more about body shape when it comes to fashion and not age, so I was confused by my own thinking. LOL. Ultimately I think I decided that following certain fashion trends is more about what you feel comfortable wearing. I really don't feel comfortable wearing camouflage because of all the reasons listed above, and also because of my age, BUT, I still think I can join the trend with an adaptation, and here it is pictured below. 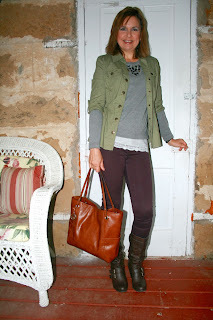 I found this Olive Green Military Jacket at Dress Barn the other day and really, really liked it. I don't normally shop at Dress Barn because it's considered 'an old lady store', but they do on occasion (like this one) have some very nice pieces that are very on trend for the older woman. I also like to go there for special occasion dresses, because so few stores sell nice dresses anymore. Anyway, I absolutely love this jacket. It's very thin, so it is perfect for this time of year when you need a little warmth from the cooler mornings and evenings, but not too much. And I feel the color and style are a great compromise to wearing the military look, but without the camouflage print. Underneath the Military Jacket I wore this bejeweled sweatshirt which I purchased from Old Navy. This is another new trend that you will be seeing everywhere: plain ordinary sweatshirts covered in jewels and sequins. A lot of women are making their own by sewing and gluing on jewels/sequins onto their old sweatshirts. HERE is a tutorial if your interested. Now, I normally don't wear sweatshirts because I always feel they make me look fat, and I still think this sweatshirt makes me look ten pounds heavier than I really am, but I still like it. It is very thin and soft, and not thick and stiff like your typical sweatshirt, and I really love how the jeweled neckline dresses the sweatshirt up so you don't feel like a slob when you leave the house. To complete the outfit, I had a light grey lace trimmed cami which was suppose to just 'peek out' from underneath the sweatshirt, but ended up hanging out a little too much for my taste for the photo. My pants are eggplant skinny jeans from Express, and dark brown boots. I love MK bags, but I can't even fathom spending $250.00-$500.00 for a purse, so I bought this 'Relic' look- a - like from J.C. Penney instead, and I really love it. And, if your braver than I, here are some pictures of current Camouflage Trends in Fashion that I really Love that I found on Pinterest. This is an example of the shirt that I almost bought the other day but resisted. I love how a fancy necklace was added to this masculine skirt to balance the outfit. Love these belts. I would be brave enough to wear these! I would never wear camo pants, but I love how camo skinnies feminize the look rather than camo cargo's. I also like how the chambray shirt and heels worn with these pants help soften the masculine camo print. This jacket is fabulous! Love the leather sleeves. She looks really cute, yet still feminine in this camo jacket because the print is balanced with skinny jeans and heels. The jacket is also very small and tailored, which also helps soften the look for women. Based on these pictures, I think if your going to wear camouflage, it looks best if it's feminized with heels, skinny jeans, jewelry, or a tighter, smaller fit. So what about you? Are you daring enough to jump on this fashion trend, or are you leaving it to the younger generation? Great post Amy, I saw some camouflage style clothes recently at old navy, and like you, I would not wear camouflage. But I did see a jacket that looked a lot like the green one you are wearing here, loved it, but didn't get it at that time (since I once again purchased kids clothes). Might get it tomorrow though if they still have it in my size. Your photo looks great, everything goes together so well. Have a great weekend! 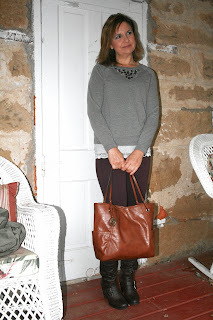 Love your jacket, boots and bag! Your outfits looks totally well put together!